Brian Moore (/briˈæn/ bree-AN; 25 August 1921 – 11 January 1999), was a novelist and screenwriter from Northern Ireland who emigrated to Canada and later lived in the United States. He was acclaimed for the descriptions in his novels of life in Northern Ireland after the Second World War, in particular his explorations of the inter-communal divisions of The Troubles, and has been described as "one of the few genuine masters of the contemporary novel". He was awarded the James Tait Black Memorial Prize in 1975 and the inaugural Sunday Express Book of the Year award in 1987, and he was shortlisted for the Booker Prize three times (in 1976, 1987 and 1990). Moore also wrote screenplays and several of his books were made into films. Moore was born and grew up in Belfast with eight siblings in a large Roman Catholic family. His grandfather, a severe, authoritarian solicitor, had been a Catholic convert. His father, James Bernard Moore, was a prominent surgeon and the first Catholic to sit on the senate of Queen's University and his mother, Eileen McFadden Moore, a farmer's daughter from County Donegal, was a nurse. His uncle was the prominent Irish nationalist, Eoin MacNeill, founder of Conradh na Gaeilge (the Gaelic League) and Professor of Irish at University College Dublin. Moore was educated at St Malachy's College, Belfast. He left the College in 1939, having failed his senior exams. The physical description of the school at the heart of The Feast of Lupercal matches closely that of Moore's alma mater and is widely held to be a lightly fictionalised setting of the College as he unfondly remembered it. Moore was a volunteer air raid warden during the Second World War and served during the Belfast Blitz in April and May 1941. He went on to serve as a civilian with the British Army in North Africa, Italy and France. After the war ended he worked in Eastern Europe for the United Nations Relief and Rehabilitation Administration. in 1948 he emigrated to Canada to worked as a reporter for the Montreal Gazette, and became a Canadian citizen. While eventually making his primary residence in California, Moore continued to live part of each year in Canada up to his death. Moore lived in Canada from 1948 to 1958, moving to New York in 1959 to take up a Guggenheim Fellowship and remaining there until his divorce in 1967. He then moved to the west coast of the United States, settling in Malibu, California, with his new wife Jean. He taught creative writing at UCLA. Moore wrote his first novels in Canada. His earliest novels were thrillers, published under his own name or using the pseudonyms Bernard Mara or Michael Bryan. Moore's first novel outside the genre, Judith Hearne, remains among his most highly regarded. The book was rejected by ten American publishers before being accepted by a British publisher. It was made into a film, with British actress Maggie Smith playing the lonely spinster who is the book/film's title character. Other novels by Moore were adapted for the screen, including Intent to Kill, The Luck of Ginger Coffey, Catholics, Black Robe, Cold Heaven, and The Statement. He co-wrote the screenplay for Alfred Hitchcock's Torn Curtain, and wrote the screenplay for The Blood of Others, based on the novel Le Sang des autres by Simone de Beauvoir. Moore criticised his Belfast schooling through his novels The Feast of Lupercal and The Emperor of Ice-Cream. Some of his novels feature staunchly anti-doctrinaire and anti-clerical themes, and he in particular spoke strongly about the effect of the Church on life in Ireland. A recurring theme in his novels is the concept of the Catholic priesthood. On several occasions he explores the idea of a priest losing his faith. At the same time, several of his novels are deeply sympathetic and affirming portrayals of the struggles of faith and religious commitment, Black Robe most prominently. Graham Greene said that Moore was his favourite living novelist, though Moore began to regard the label as "a bit of an albatross". Moore was married twice. His first marriage, in 1952, was to Jacqueline ("Jackie") Sirois (née Scully), a French Canadian and fellow-journalist with whom he had a son, Michael (now a professional photographer), in 1953. They divorced in October 1967 and Jackie died in January 1976. Moore married his second wife, Jean Denny, a former commentator on Canadian TV, in October 1967. Moore's beachside house in Malibu, California was celebrated in Seamus Heaney's poem Remembering Malibu. Moore's widow lived on in the house until it was destroyed in 2018 in the Woolsey Fire. Brian Moore died at his Malibu home on 11 January 1999, aged 77, from pulmonary fibrosis. He had been working on a novel about the 19th-century French symbolist poet Arthur Rimbaud. His last published work before his death was an essay entitled "Going Home". It was a reflection inspired by a visit he made to the grave in Connemara of his family friend, the Irish nationalist Bulmer Hobson. The essay was commissioned by Granta and published in The New York Times on 7 February 1999. Despite Moore's often conflicted attitude to Ireland and his Irishness, his concluding reflection in the piece was "The past is buried until, in Connemara, the sight of Bulmer Hobson's grave brings back those faces, those scenes, those sounds and smells which now live only in my memory. And in that moment I know that when I die I would like to come home at last to be buried here in this quiet place among the grazing cows." The Creative Writers Network in Northern Ireland launched in 1996 the Brian Moore Short Story Awards, which are now open to all authors of Irish descent. Previous judges have included Glenn Patterson, Lionel Shriver, Carlo Gébler and Maeve Binchy. Moore has been the subject of two biographies, Brian Moore: The Chameleon Novelist (1998) by Denis Sampson and Brian Moore: A Biography (2002) by Patricia Craig. Brian Moore and the Meaning of the Past (2007) by Patrick Hicks provides a critical retrospective of Moore's works. Information about the publishing of Moore's novel, Judith Hearne, and the break-up of his marriage can be found in Diana Athill's memoir, Stet (2000). In 1975 Moore arranged for his literary materials, letters and documents to be deposited in the Special Collections Division of the University of Calgary Library, an inventory of which was published by the University of Calgary Press in 1987. Moore's archives, which include unfilmed screenplays, drafts of various novels, working notes, a 42-volume journal (1957–1998), and his correspondence , are now at The Harry Ransom Humanities Research Center, at the University of Texas at Austin. "Old Father, Old Artificer", in Irish University Review, 12 (Spring 1982), chapter 12 (on James Joyce). Two Stories (1978) Northridge, California: Santa Susana Press. Contains "Uncle T" and "Preliminary Pages for a Work of Revenge"
Hicks, Patrick. "Sleight-of-Hand: Writing, History and Magic in Brian Moore's The Magician's Wife" Commonwealth Essays and Studies ["Postcolonial Narratives" Issue] 27, 2 (Spring 2005), pp. 87–95. Koy, Christopher. "Representations of the Quebecois in Brian Moore's Novels", Considering Identity: Views on Canadian Literature and History Olomouc: Palacký University Press, 2015, pp. 141–156. ^ Dahlie, Hallvard (1999). "Brian Moore, 1921–99". In Memoriam. University of Calgary. Retrieved 24 April 2014. ^ a b c d e f g h i Lee, Hermione (14 February 1993). "BOOK REVIEW / Nomadic life of Brian: It's hard to keep up with Brian Moore, an Irishman with Canadian citizenship living in Malibu whose new novel is based on Haiti. But it's time his work was acclaimed". Independent on Sunday. Retrieved 25 August 2014. ^ "Brian Moore: Forever influenced by loss of faith". BBC Online. 12 January 1999. Retrieved 23 September 2011. ^ Cronin, John (13 January 1999). "Obituary: Shores of Exile". The Guardian. Retrieved 23 September 2011. ^ a b Walsh, John (14 January 1999). "Obituary: Brian Moore". The Independent. Retrieved 31 August 2012. ^ Flanagan, Thomas (17 January 1999). "Brian Moore: An Appreciation". Los Angeles Times. Retrieved 25 April 2014. ^ "Brian Moore". Culture Northern Ireland. 25 November 2008. Archived from the original on 7 December 2013. Retrieved 24 August 2012. ^ Flood, Jeanne (1974). Brian Moore. Lewisburg, Pennsylvania: Bucknell University Press. ISBN 9780838779729. Retrieved 21 August 2012. ^ a b c d e Smith, Dinitia (12 January 1999). "Brian Moore, Prolific Novelist on Diverse Themes, Dies at 77". The New York Times. Retrieved 19 January 2018. ^ a b c d Moore, Brian (7 February 1999). "Going Home". The New York Times. Retrieved 3 January 2014. ^ Spencer, Clare (6 May 2011). "Why do some schools produce clusters of celebrities?". BBC News. Retrieved 24 August 2012. ^ a b Lynch, Gerald (16 December 2013). "Brian Moore". The Canadian Encyclopedia. Retrieved 19 January 2018. ^ Blades, John (5 January 1998). 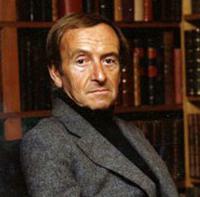 "Brian Moore: Travels of a Literary Infidel". Publishers Weekly. Retrieved 19 January 2018. ^ a b Sampson, Denis (1998). Brian Moore: The Chameleon Novelist. Toronto: Doubleday Canada. ^ "Local Writing legends – Brian Moore: Growing Up". Get Writing NI. BBC. Retrieved 8 November 2012. ^ Prose, Francine (2 September 1990). "The Reluctant Terrorist". The New York Times. Retrieved 29 October 2012. ^ Boland, Rosita (13 January 1999). "Praise for Moore's lasting impact on Irish fiction". The Irish Times. Retrieved 14 August 2018. ^ a b Bradfield, Scott (14 December 2018). "The Woolsey fire destroyed a literary haven, but the stories of Brian Moore's house remain". Los Angeles Times. Retrieved 11 March 2019. ^ Byrne, James P; Coleman, Philip; King, Jason (2008). Ireland and the Americas: Culture, Politics and History, vol.1. Santa Barbara, California: ABC-CLIO Inc. p. 610. ISBN 978-1-85109-614-5. ^ a b Craig, Patricia (2002). Brian Moore: A Biography. Bloomsbury Publishing. pp. 194 and 224. ^ "His Own Pursuit of An Older Woman Sparked Brian Moore's Latest Novel". People. 25 October 1976. Retrieved 30 June 2018. ^ Fulford, Robert (12 January 1999). "A writer who never failed to surprise his readers". The Globe and Mail. Retrieved 28 August 2012. ^ "Brian Moore Short Story Awards". Culture Northern Ireland. 9 January 2009. Retrieved 24 August 2012. ^ "Patricia Craig". Culture Northern Ireland. 5 September 2006. Retrieved 6 July 2015. ^ a b "Brian Moore: A Preliminary Inventory of His Papers". Harry Ransom Center, University of Texas at Austin. Retrieved 19 January 2018. ^ O'Toole, Fintan (17 January 1999). "Brian Moore: An Appreciation". Los Angeles Times. Los Angeles Times. Retrieved 31 August 2012. ^ McSweeney, Kerry (1983). Four Contemporary Novelists. Kingston, Ontario and Montreal: McGill-Queen's University Press; London: Scolar Press. pp. 55–99. "The essential sameness of the Belfast of the post-1970 Troubles and the city he lived in from his birth in 1921 until his early twenties is the subject of Moore's finest piece of non-fictional prose." ^ "The Mangan inheritance". Catalogue. Aberdeen City Council. Archived from the original on 2 April 2015. Retrieved 31 March 2015. ^ a b c Crowley, Michael (Summer 1998). "Stage and Screen: A Brian Moore Filmography". Studies: An Irish Quarterly Review. 87 (346): 142–144. JSTOR 30091888. ^ a b c "Famous works". Brian Moore Biography (1921–1999). Film Reference. Retrieved 3 April 2014. ^ "Our Collection: The Sight". National Film Board of Canada. 2 May 2012. Retrieved 24 August 2012. ^ Sauter, van Gordon (10 April 1988). "Just Color Moore a Novelist". Los Angeles Times. Retrieved 3 April 2014. ^ "Our Collection: Uncle T". National Film Board of Canada. 2 May 2012. Retrieved 19 January 2018. ^ "Our Collection: The Lonely Passion of Brian Moore". National Film Board of Canada. 2 May 2012. Retrieved 19 January 2018. ^ Koy, Christopher (2015). "Representations of the Québécois in Brian Moore's Novels". Considering Identity: Views on Canadian Literature and History. Olomouc: Palacky University: 141–156. ^ Sampson, Denis (March 1995). "'Home: A Moscow of the Mind': Notes on Brian Moore's Transition to North America". Colby Quarterly. 31 (1): 46–54. "Obituaries – Brian Moore: Forever influenced by loss of faith". BBC News. 12 January 1999. Bemrose, John (16 December 2013). "Brian Moore (Obituary)". The Canadian Encyclopaedia. Retrieved 1 February 2016.